Monday night marked my first attempt at dyeing with Kool-Aid. I attempted this as part of a Ravelry exchange in the Monthly Adventures group. We exchanged packages with some goodies and packages of Kool-Aid....that was part I. Part II is the fun part - we were to dye a skein of yarn and send it to the person who sent us the Kool-Aid package. Part III begins in September where we'll be doing a Knit-a-Long (KAL) with our dyed skeins. This exchange has been a LOT of fun - just as all our exchanges have been! 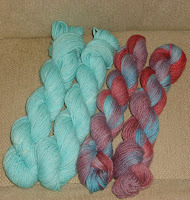 I had two skeins of yarn to dye - one skein for me, and one for my "Kool-Aid Pal". My pal had sent me instructions on how to dye with two main ways of dyeing - painting/pouring the dye on the yarn for multi-colored yarn or dyeing it by boiling it in a pot for a more uniform dye job. 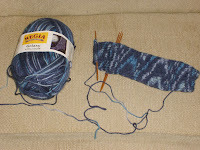 I decided to split each skein and dye half of a skein one way, and the other half, a second way. First, I soaked the skeins to thoroughly wet them in preparation for dyeing. I laid out the first two skeins (one for my pal, one for me) on a large black plastic bag. I mixed up the first color - "Black Cherry" and applied it with a small baster. I then added some purple and "squeezed" the reds and the purples into each other for blending. I also "dotted" some purple on the reds. 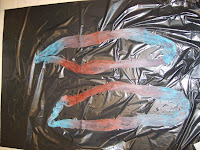 I then "rolled" the baster over the colored sections to help blend and spread the colors. What I found was that sometimes, the purple "fractured" into a reddish and a blue, so I didn't get as true of a purple as I had hoped. Then, I added the blue "dye" and blended the edges again. I was a bit disappointed at how the colors looked together. I like all the colors, but they just didn't "pop" like I expected them to. I think I need some more practice at the "hand-painting" style of dyeing! 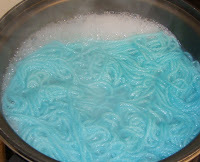 I decided to dye the second skein for each of us in a turquoise-blue. I only had one more packet of the blue I used in the first skein, so there wasn't going to be enough to really saturate it with color. I rummaged through my Kool-Aid stash and found that I had two packets of "Ice Blue", so I used that instead. I LOVE this color....it reminds me of Easter! The skeins were then hung in my shower to dry. Luckily, with the AC on, they dry pretty quickly - which is a good thing as they need to be mailed on the 30th at the latest! The dried skeins look better than I'd originally thought they would. The way the colors blend when twisted together is much more pleasing than when they were hanging in my shower. I definitely like the solid turquoise as a contrast to the multi-colored. I'm finished! One turquoise skein and one multi-colored skein for my pal....and one set of the same for me. 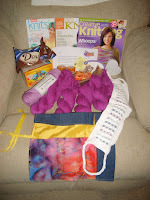 I can't wait to see what our KAL project will be - I know it will be something fabulous and fun! Although I'd hoped to finish the Chevron scarf on Sunday, I didn't get it finished until Monday evening. I love how it turned out - the color and the subtle patterning are very pleasing...makes me ALMOST wish for the colder weather so I can wear it! The scarf definitely needs to be blocked though - the sides have a tendency to curl under otherwise. 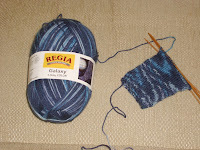 Finally, I have made some progress on my Galaxy socks - I've completed the heel shaping. I'm ready to pick up the stitches for the gusset. Wahoo! Sunday was absolutely gorgeous! 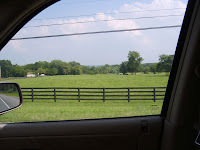 Sandy and I went on a long walk and enjoyed all the natural beauty that surrounded us. 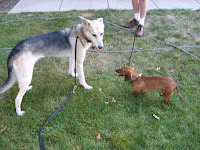 We even ran into her buddy, Snoopy, a miniature Dachshund. Sorry that the picture is so blurry - it's nearly impossible to get the two of them to hold still for a picture...they're so playful! 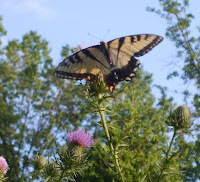 Last year, I tried unsuccessfully to get a good picture of a Swallowtail butterfly...the state butterfly AND the state insect of Virginia. The main reason I "needed" a good picture of it was because I'd made the "Swallowtail Shawl" by Evelyn A. Clark and I wanted to have a record of the inspiration for the shawl. This is the best I could do....much better than last year's attempts! During the walk, I collected several handfuls of goldenrod to prep for dye. I know what you're thinking...most people won't go near the stuff! However, I'm not bothered by allergies - thankfully! I selected the dye method by going through the natural dyeing books I received from my MIL and my friend Lisa. I selected the easiest recipe. I skimmed off the flowers from several bunches and boiled them in 8 cups of water. I then reduced it to about 6 cups.I plan to dye some roving with the dye this weekend - hopefully it will be much prettier than the color of the dye! 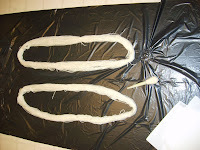 The actual dye process will involve boiling the roving in the dye and then washing it with water containing Ivory soap flakes. Using the Ivory is supposed to produce a nice golden yellow. Look for an update on the goldenrod dyeing this weekend! 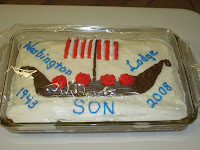 Happy Anniversary Sons of Norway Lodge 3-428! Yesterday was our Sons of Norway Annual Lodge Picnic. This year, it was a very special picnic as we were celebrating 65 years as a lodge! How cool is that! The picnic was held at our Norwegian Cultural Center in Fairfax, VA. This cake (made by Pat DeRoche) was the perfect dessert for the celebration - isn't it gorgeous? It was YUMMY too - chocolate...mmmmmm! Great job Pat! Knitting progress....yes, there has been some! I've completed the heel flap on the first Galaxy sock. I really like how the fabric is knitting up - it's quite lovely. The blues are very soothing. 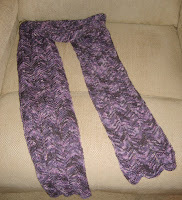 My purple Chevron scarf in the hand-dyed purples is nearly finished! There's just a small bit of yarn left to knit. If I really get busy and finish up all my projects for home and work, I may even be able to finish it tonight! I really love the feel of the yarn - it's so soft! You can't go wrong with Merino! Oh...I FINALLY got the Noni Patterns I've been lusting over - the "Yummy Lunch" (Lunch Bag), the "Oven Mittens", "Three Confections" and "Green Earth" (shopping bag). (There are still a few more that I "need" - "Retro Bag", "Tulip Tote", "Flamenco", Metro", "Lenten Roses", and "Shirley Poppies". They just came in this week at Nature's Yarns. Next on my agenda - Kool-Aid dye some yarn for my Ravelry Monthly Adventures and ship some off to my swap pal. We only had to dye 50 g. of yarn, but I'm probably going to do 100 g. - at least that way, there would be enough for a small bag of some sort. 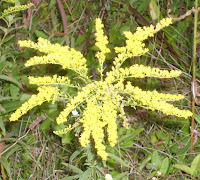 After that, my next dyeing project will probably involve some goldenrod. It's that time of year again and the stuff is EVERYWHERE! (Thankfully, I don't suffer from allergies.) I have to research a bit about the dye process, but that will be VERY easy as I got a Navajo and Hopi dye book from my in-laws and a very complete dye book (for wool and cotton) from my friend Lisa. Between the two books, I should be able to come up with an appropriate dye recipe. Finally, I'll leave you with a "cute animal" shot. It's my dog, Sandy, and her boyfriend, Rooney. Rooney and her are so cute - they always kiss each other if they happen to meet on our walk. 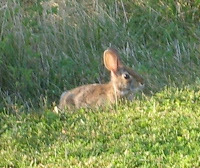 Sandy has several other "doggie buddies" in the neighborhood as well....hopefully, I'll get some photos of them as well! 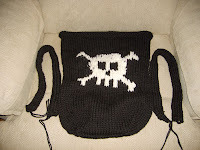 Last week, I finally finished the knitting portion of the Skull Knitting Tote. All that's left now to do is to attach the handles and felt it! I really like how this turned out - I just wish it were bigger. It will shrink down quite a bit, but it will still make a nice "sock project bag" or "scarf project bag". I've worked some on my socks as I commute on the Metro, though most of the time, it's been a bit too crowded to knit. The news said there were a record 21 million riders on the Metro for the month of July - more than ever in the 32 year history of the system! I do listen to knitting podcasts as I ride though...there's always room enough to get out the iPod! 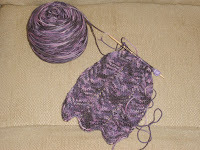 I've also started a scarf in the Chevron pattern from one of the gals in the Angel Yarns Forum. I love it! It's such a simple pattern, yet it looks very elegant. The yarn is hand-dyed by a friend of mine - don't you just LOVE the purple colorway? Oh.....speaking of purple, I just got my new computer - fabulous new job....fabulous new computer....I love it! 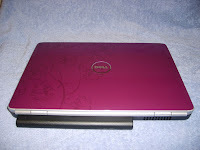 When I ordered my new computer, I was thrilled to death to find out that Dell offered many colors choices....and one of them was purple! How cool is that? Happy International Left Hander's Day! It's that time of year again! Today, we all celebrate "Lefties". As is my personal custom, I baked a lemon cake with lemon frosting and brought it to work! Everyone is welcome to join me in a piece of "Lefty Cake", but if they're right handed, I request that they eat with their left hand! Watching the "righties" eat with their left hand sometimes provides some impromptu entertainment....LOL! Happy International Left Hander's Day Everyone! Alas...it was time for the long drive home. 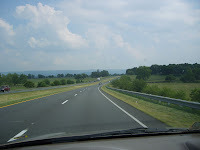 The latter part of my journey will have lots of gorgeous scenery as I'll be leaving the "flatlands" of the Midwest and returning to the rolling hills and mountains of the East Coast. It's a long drive, so I had to start out quite early as I wanted to arrive back home in time for dinner - DH promised to take me out to my favorite kebab place, Sorrento Grill. 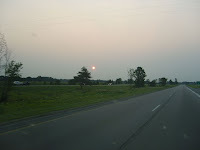 It was a bit hazy as I pulled out of Lansing, so the sunrise wasn't nearly as spectacular as I had hoped! 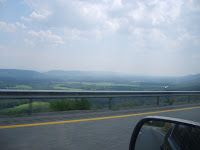 My long drive through the "flatlands" was rewarded in Pennsylvania as the majesty of the mountains and the hilly roads started to envelope me. 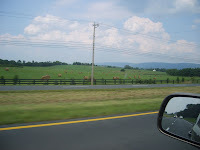 The pretty sites continued through Maryland as well. 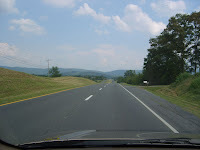 The "Welcome to West Virginia" sign was a very welcome site....just a few more miles until Virginia and the beautiful mountain scenes provided by the Shenandoah and Blue Ridge Mountains. Ah.....home again! 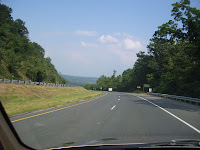 The very welcoming "Virginia" sign - this means that I'm just over an hour from home, so I'm almost there! As I continue down Rt. 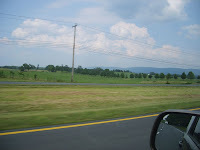 81, I see some beautiful "hills" off in the distance - the Blue Ridge Mountains perhaps? The final stretch of the drive along Rt. 7 was also very pretty. One of the farms had baled their hay in the round mounds - I love how that looks! 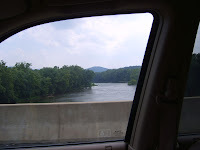 The farms and the views of the Shenandoah River are so inviting and full of natural beauty! I finally arrived home. 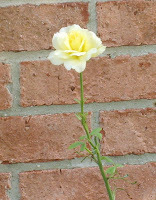 I was greeted by a lovely yellow rose on one of my rose bushes and lots of tail wags and kisses from my dog. DH was quite happy to see me as well! It's SO good to be home! After quickly unpacking and having dinner at Sorrento, I decided to try to get some knitting done in spite of how tired I was. There's just something soothing and relaxing about a couple of sticks and some string - it's a great way to unwind after a long trip. 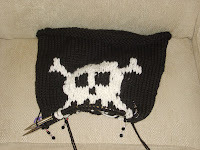 I managed to get quite a bit done - I nearly finished the pattern portion of the Skull Knitting Tote. 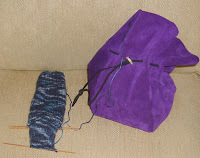 Now I just have the easy part left....knitting the base of the bag, knitting the straps, and attaching them to the bag. Then, it's off to the washing machine for felting! 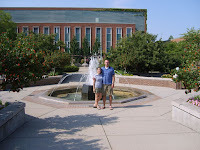 I'm FINALLY getting back to posting about the trip to Michigan and the visit to Michigan State where DD is almost done with her PhD in Chemistry! Wahoo! 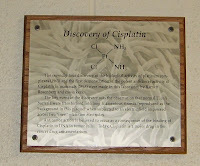 FYI - Michigan State is where Cisplatin, a fabulous anti-tumor drug, was discovered - as a result, many lives have been saved! We visited both the Garden and the Children's Garden. My favorite was the Children's Garden as it had some interesting and educational exhibits mixed in with the plants. Of course, no post would be complete without something about knitting or sheep, so let me take care of that right away. 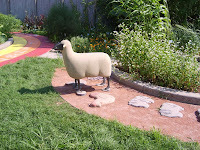 The first thing I spotted upon entering the garden was the sheep statue - then, I "knew" I would be right at home. There's just something comforting about sheep....don't you agree? There were benches scattered throughout the gardens where you could rest and look around This one is one of my favorites, although it's a bit nestled into the plants, so it wouldn't be very comfortable to sit on! 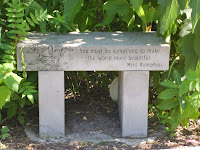 I just love the saying on the bench, "We must do something to make the world more beautiful.". I also found a very interesting sun dial. It was quite different from any sun dial I'd ever seen before. There were no instructions, but it was quite simple to use. 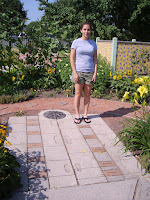 Across the top of the path was a semi-circle with numerals representing the hours. The center boasted the usual "happy sun face". The walkway leading up to the face had the names of all the months on it. DD graciously volunteered to stand on "July" for me as we were there in July. 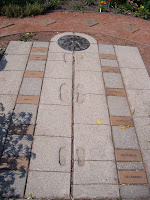 The shadow cast will lie across the numerals at the top to indicate the time. Our watches indicated that it was 4:40 pm. As you can see, when you stand at the appropriate month, the time displayed is fairly accurate - I was quite impressed! The most interesting thing I found in the garden, in addition to the gorgeous flowers, was the Plant Biology building. 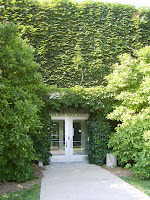 The building was TOTALLY covered with ivy vines - the only visible portion of the building was the door. All I could think of was, "How appropriate for the Plant Biology building!" 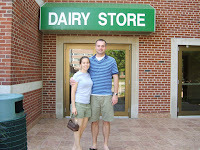 Our final stop was the Michigan State Dairy store - mmmmm! (DD and her boyfriend graciously posed for me again.) They had ice cream and cheese made right there on the premises! I also picked up a couple of yummy cheeses to take home: pepper jack and smoked cheddar. Mmmmm! Of course, we all had to get some ice cream while we were there. 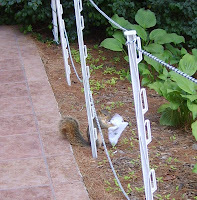 This squirrel had it's little face pressed up against the door....longing to go inside for some ice cream himself! I tried to take a quick photo, but the action of getting out my camera spooked him a bit. He scurried over to the other side of the path. My little friend did find a napkin with remnants of ice cream on it that he quickly "gobbled up". Oh...I almost forgot. 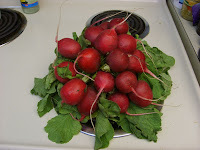 Here's a photo of the HUGE bunch of radishes I picked up at the City Market. I could not get over the size of the bunch nor the size of the individual radishes. There were 20 radishes in the bunch - amazing! And it was only 99 cents! Compare that to the small bunch of 6 or 7 that you can get at the grocery store for $1.49! Hmm....that's something I've never done. I've made knitted items as gifts for family and friends, but never entered anything into a fair. I've even made a felted bag for a charity auction - it went for a very good price and I was quite pleased. However, it wasn't my design so it was entered with permission from the designer and I credited her with the design on the labels and tags for the item. I guess that if I ever DO create something original - that I've both designed and knit - I might consider entering it into a fair. I have seen so many fabulous fabulous items at the various fairs that I'd be up against some very tough competition! I guess I need to "hone my skills" a bit more before I truly feel comfortable entering anything into the competition! WOW! SP12 - I'm VERY Spoiled! I have the most awesome spoiler! I just got back from vacation and started a great new job, so I've had no time to post until today - this past week has just flown by! I haven't even had a chance to post about the final day in Michigan and my trip home! I did manage to fire off a "thank you" to my spoiler earlier this week so she'd know that I received the package! 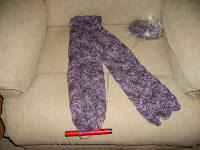 I just LOVE everything - especially the very cuddly alpaca yarn in an absolutely lovely purple color way - YUMMY!!! 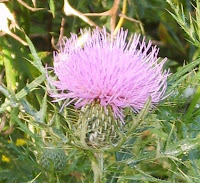 I also love the purple cotton wool in a lilac color. The package was chock full of tons of goodies - candies, bath time pampering supplies, stitch markers, a needle roll, several magazines, chocolate, tea, heart shaped note pad, and candles....whew! She even included a hand crafted "back scrubber" for me - I LOVE it! I either like to knit on my couch, snuggled up with some supporting pillows (to prevent knitting fatique) or with a group of friends at a local coffee or sandwich shop. Coffee and cushioned seats are definitely added bonuses where ever I'm knitting! On a hot summer evening, I love to have some refreshing home made chicken salad (with cilantro and dried cranberries) on a bed of lettuce with sliced garden fresh tomatoes on the side. Mmmmm! Preparation: Cook 1 to 2 lbs of chicken and cool it down (I usually boil it). Cut it into chunks. Take a large handful of fresh cilantro (leaves only) and coarsely chop it (add more or less as per your preference - I love cilantro so I add quite a bit) Add a good handful of dried cranberries (I use about 1/2 of a 6 oz. package of "Ocean Spray Craisins") - again, put in more or less as per your preference. Cut up 3-4 spring onions (including about 1/2 of the green stems). Put cut up chicken, cilantro, "Craisins" and spring onions in a large bowl and gently mix. Add about 1/2 of the dressing. Stir well. Add more of the dressing until you have your preferred amount. Chill at least 3 hrs. to let the flavors blend (it's best if chilled over night). Serve on a bed of lettuce. (The cilantro and "Craisins" really make this a refreshing salad.) Enjoy!